Rajasthan is where all the country`s similes and metaphors appear to have come together to create a visual extravaganza. Majestic palaces and rugged forts, spectacular deserts, wooded hills and tranquil lakes, bustling towns and quiet villages, amazing flora and fauna and of course, the colorful and vibrant people of Rajasthan form an intricate tapestry of mysticism, grandeur and rusticity. Rajasthan, literally means "Land of the Kings", was once a clutch of princely kingdoms. The Rajputs, who ruled here for over a thousand years, were legendary for their chivalry. Today, this desert state`s battle-scarred forts, historic cities, palace hotels, feudal traditions and riotous colors represent India at her exotic best. Situated on the western side of the country, the state is diagonally divided into the hilly and rugged southeastern region and the barren northwestern Thar Desert, which extends across the border into Pakistan. Day 02: Full day combine city tour of old & New Delhi. Day 03: Morning drive to Pehrasar. Day 04: Morning drive to Karauli . Afternoon continue drive to Bijaipur. Day 08: Drive to Ghanerao. Rest of the day at leisure. Day 09: Morning drive to Rohet enroute visiting Ranakpur Jain temples and Kumbhalgarh Fort. Day 10: Drive to Garah enroute visiting Jodhpur. Day 11: Morning Camel Safari. Afternoon drive to Jamba enroute visiting Phalodi. Day 14: Day free to relax at the hotel. Day 15: Drive to Delhi and transfer to International airport in time to board flight for back home. Karauli is a holy city situated 160 kms from Jaipur and was an erstwhile princely state in estern Rajasthan, famous for its pale red-stone. Founded in 1348, the city was earlier called Kalyanpuri, after the local deity Kalyanji. The city was strongly fortified by its rulers and was surrounded by a wall of red sandstone, strengthened by bastions at several places. The peripheral wall, now dilapidated, once had six gates. The old city palace is a treasure trove of architecture, stone carvings, gorgeous jalli work and classic paintings. Legend has it that the ruling family of Karauli, recognised as the head of the Yadhuvanshi Rajputs, are the descendants of Lord Krishna. The Kaila Devi Game Sanctuary is situated 25 kms from here and is an extension of the Ranthambore Tiger Project. 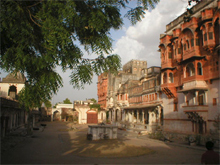 Ghanerao, formerly known as Ganora, was founded in 1606 by Gopal Das Rathore, a brave Rajput warrior from the Mertia clan. It is a small town but located strategically at the entrance of one of the few passes in the Aravallis, that connects the two major cities, Jodhpur and Udaipur. This tiny village thus formed a link between the territories held by the two traditional strongholds of Rajasthan, Mewar and Marwar, and featured often in the history of both these two erstwhile princely states. 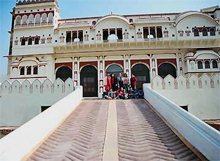 Rohetgarh `Garh` in Hindi means Fort. The principality of Rohet was control from this little Fort- Palace by the royalty which lived here and who gave their elegance to the Maharaja of Jodhpur. The descendents of this royal family still live here and maintain a very interesting residence where guests are introduced to their royal past. 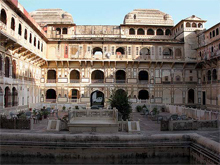 Shekhawati is popularly known as an open air art gallery and Surajagrh is at the heart of it and boasts of many havelis. Walking and camel cart tours are organized to the havelis. The Marwari traders accumulated enormous wealth in their trade of rice, opium, cotton, spices and textiles. The wealth was usually reinvested or sent back home for their families. The affluent marwari families tried to outdo the other in the size and quality of their mansions, giving birth to fine and colourful architecture in the desert region where it was least expected.